"Spatially Resolved Dust, Gas, and Star Formation in the Dwarf Magellan" by D. Calzetti, G W. Wilson et al. We investigate the relation between gas and star formation in subgalactic regions, ˜360 pc to ˜1.5 kpc in size, within the nearby starburst dwarf NGC 4449, in order to separate the underlying relation from the effects of sampling at varying spatial scales. Dust and gas mass surface densities are derived by combining new observations at 1.1 mm, obtained with the AzTEC instrument on the Large Millimeter Telescope, with archival infrared images in the range 8-500 μm from the Spitzer Space Telescope and the Herschel Space Observatory. We extend the dynamic range of our millimeter (and dust) maps at the faint end, using a correlation between the far-infrared/millimeter colors F(70)/F(1100) (and F(160)/F(1100)) and the mid-infrared color F(8)/F(24) that we establish for the first time for this and other galaxies. Supplementing our data with maps of the extinction-corrected star formation rate (SFR) surface density, we measure both the SFR-molecular gas and the SFR-total gas relations in NGC 4449. We find that the SFR-molecular gas relation is described by a power law with an exponent that decreases from ˜1.5 to ˜1.2 for increasing region size, while the exponent of the SFR-total gas relation remains constant with a value of ˜1.5 independent of region size. We attribute the molecular law behavior to the increasingly better sampling of the molecular cloud mass function at larger region sizes; conversely, the total gas law behavior likely results from the balance between the atomic and molecular gas phases achieved in regions of active star formation. Our results indicate a nonlinear relation between SFR and gas surface density in NGC 4449, similar to what is observed for galaxy samples. 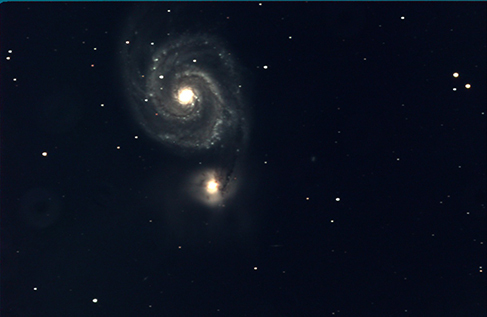 Based on observations obtained with the Large Millimeter Telescope Alfonso Serrano - a bi–national collaboration between INAOE (Mexico) and The University of Massachusetts - Amherst (USA). Calzetti, D.; Wilson, G W.; Draine, B. T.; Roussel, H.; Johnson, K. E.; Heyer, M. H.; Wall, W. F.; Grasha, K.; Battisti, A.; Andrews, J. E.; Kirkpatrick, A.; González, D. Rosa; Vega, O.; Puschnig, J.; Yun, M.; Östlin, G.; Evans, A. S.; Tang, Y.; Lowenthal, James; and Sánchez-Arguelles, D., "Spatially Resolved Dust, Gas, and Star Formation in the Dwarf Magellanic Irregular NGC 4449" (2018). Astronomy: Faculty Publications, Smith College, Northampton, MA.